At the start of Shelter brainstorms we always say the same thing, “no black hats,” there are no bad ideas. We’ll work out the details later, creativity comes first. This philosophy led to our most recent campaign: A lonely brick. With competition for space on traditional channels more fierce than ever, we wanted to find a new and creative way to bring the housing crisis to life. Crucially, we wanted to move away from the doom and gloom of normal charity campaigning, and use positive messages to inspire people to take action. When one of our studio team struck upon the idea of putting a brick on Tinder, we knew we’d hit the mark. The rationale was as follows – we aren’t building enough homes, this means a lot of redundant bricks, and one by itself seems quite lonely. 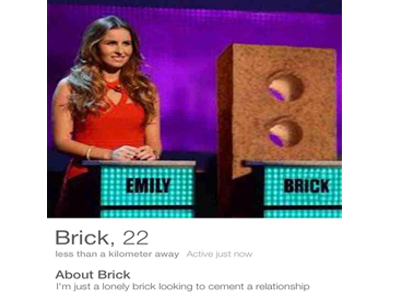 A brick on Tinder could ask people to help it cement a new relationship, by getting people to call on politicians to build more affordable homes. Simple. Once we got going we realised the concept did most of the work itself. We had so many puns to pick from we even set up a brick related pun matrix (how many charity campaigners get to say that?). More importantly, the reception was incredible. People bonded with the brick straight away, and really got into it. The idea spread like wildfire. Lad Bible uncovered it first, then a lot of online Tumblrs and blogs. Once we hit 1,000 matches on Tinder we started getting interest from journalists too. We pitched the idea to Us vs Them (an offshoot of the Daily Mirror), had it featured on Snap.PA (the Press Association wire for online news stories), and received pick up in a wide range of other places too. Our supporting collateral gave a richer experience for those who wanted it. We used a Tumblr to host our conversations, a blog explaining the issues behind the campaign, and a bespoke teaser site – where people could pledge to help the brick find love. Hundreds of people have got on board with the campaign so far. It’s helping Shelter reach a new audience, in a fun and engaging way. A question we’ve had a lot from colleagues in the sector is, “how did you get it signed off?” At Shelter we're actively encouraged to take calculated risks. In fact every month we review instances where we’ve tried new ideas – and then dissect what happened. New ways of thinking are explored and interrogated, but they’re also celebrated, even when mistakes have been made. Because if we’re trying new things, we’re continually learning. This culture has allowed us to experiment and test, continually refining our comms and improving our campaigning, it also allowed us to take a chance on this idea. There are things we’ve learnt for next time, but given the campaign cost no money (other than £8 for a Tinder subscription), required minimal resource, and has delivered quality PR for Shelter and our campaigning – it’s been worth it. Taking a risk is worthwhile when the idea is good enough. Tom McCarthy is a campaigns officer at Shelter, and is currently working on Shelter’s General Election campaign.